I'm trying to get my awful rating of -133 to at least a neutral or even better a good rating, do if you could find it in your heart one up my post. Thanks everyone who help, you are awesome. If you didn't like the last post then maybe this post is more to your liking. It's good to know you all care so much to grant me negative votes thank you so much. If you want possitive rating do something good for the comunity. Don't spam the forum; participate actively to it and the possitive votes will come as well. PS. If you have negative votes I presume they had a reason for that. 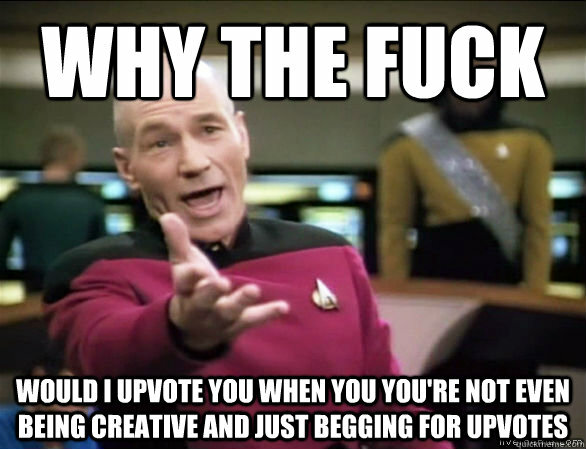 Picard is the best captain, you hilarious jerk, ok you get an upvote.